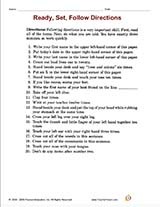 Try a math activity that focuses on following directions. Focus on following directions with this printable word-usage activity. Questions to accompany the Back to School Baseball Card activity.